The biggest solar proton storm in 15 years erupted last week. NASA researchers discuss what it might have done to someone on the Moon. 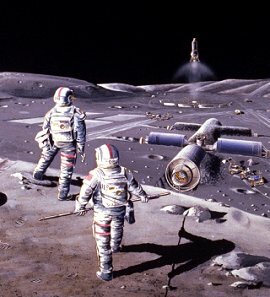 January 27, 2005: NASA is returning to the Moon--not just robots, but people. In the decades ahead we can expect to see habitats, greenhouses and power stations up there. Astronauts will be out among the moondust and craters, exploring, prospecting, building. Last week, though, there were no humans walking around on the Moon. 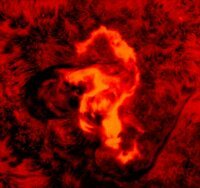 On January 20th, 2005, a giant sunspot named "NOAA 720" exploded. The blast sparked an X-class solar flare, the most powerful kind, and hurled a billion-ton cloud of electrified gas (a "coronal mass ejection") into space. Solar protons accelerated to nearly light speed by the explosion reached the Earth-Moon system minutes after the flare--the beginning of a days-long "proton storm." Here on Earth, no one suffered. Our planet's thick atmosphere and magnetic field protects us from protons and other forms of solar radiation. In fact, the storm was good. When the plodding coronal mass ejection arrived 36 hours later and hit Earth's magnetic field, sky watchers in Europe saw the brightest and prettiest auroras in years: gallery. The Moon is a different story. "The Moon is totally exposed to solar flares," explains solar physicist David Hathaway of the Marshall Space Flight Center. "It has no atmosphere or magnetic field to deflect radiation." Protons rushing at the Moon simply hit the ground--or whoever might be walking around outside. The Jan. 20th proton storm was by some measures the biggest since 1989. It was particularly rich in high-speed protons packing more than 100 million electron volts (100 MeV) of energy. Such protons can burrow through 11 centimeters of water. A thin-skinned spacesuit would have offered little resistance. "An astronaut caught outside when the storm hit would've gotten sick," says Francis Cucinotta, NASA's radiation health officer at the Johnson Space Center. At first, he'd feel fine, but a few days later symptoms of radiation sickness would appear: vomiting, fatigue, low blood counts. These symptoms might persist for days. 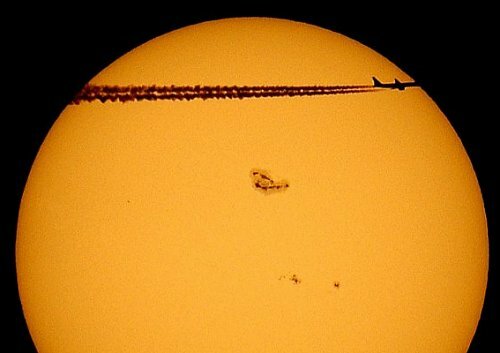 Above: Giant sunspot 720 (and a passing airplane) photographed by amateur astronomer Jan Koeman of the Netherlands on Jan. 15, 2005. Astronauts on the International Space Station (ISS), by the way, were safe. The ISS is heavily shielded, plus the station orbits Earth inside our planet's protective magnetic field. "The crew probably absorbed no more than 1 rem," says Cucinotta. One rem, short for Roentgen Equivalent Man, is the radiation dose that causes the same injury to human tissue as 1 roentgen of x-rays. A typical diagnostic CAT scan, the kind you might get to check for tumors, delivers about 1 rem [ref]. So for the crew of the ISS, the Jan. 20th proton storm was no worse than a trip to the doctor on Earth. On the Moon, Cucinotta estimates, an astronaut protected by no more than a space suit would have absorbed about 50 rem of ionizing radiation. That's enough to cause radiation sickness. "But it would not have been fatal," he adds. To die, you'd need to absorb, suddenly, 300 rem or more. The key word is suddenly. You can get 300 rem spread out over a number of days or weeks with little effect. Spreading the dose gives the body time to repair and replace its own damaged cells. But if that 300 rem comes all at once ... "we estimate that 50% of people exposed would die within 60 days without medical care," says Cucinotta. Such doses from a solar flare are possible. To wit: the legendary solar storm of August 1972. It's legendary (at NASA) because it happened during the Apollo program when astronauts were going back and forth to the Moon regularly. At the time, the crew of Apollo 16 had just returned to Earth in April while the crew of Apollo 17 was preparing for a moon-landing in December. Luckily, everyone was safely on Earth when the sun went haywire. "A large sunspot appeared on August 2, 1972, and for the next 10 days it erupted again and again," recalls Hathaway. The spate of explosions caused, "a proton storm much worse than the one we've just experienced," adds Cucinotta. Researchers have been studying it ever since. Cucinotta estimates that a moonwalker caught in the August 1972 storm might have absorbed 400 rem. Deadly? "Not necessarily," he says. A quick trip back to Earth for medical care could have saved the hypothetical astronaut's life. Surely, though, no astronaut is going to walk around on the Moon when there's a giant sunspot threatening to explode. "They're going to stay inside their spaceship (or habitat)," says Cucinotta. An Apollo command module with its aluminum hull would have attenuated the 1972 storm from 400 rem to less than 35 rem at the astronaut's blood-forming organs. That's the difference between needing a bone marrow transplant â€Ś or just a headache pill. The hull of an Apollo command module rated 7 to 8 g/cm2. A modern space shuttle has 10 to 11 g/cm2. The hull of the ISS, in its most heavily shielded areas, has 15 g/cm2. Future moonbases will have storm shelters made of polyethelene and aluminum possibly exceeding 20 g/cm2. A typical space suit, meanwhile, has only 0.25 g/cm2, offering little protection. "That's why you want to be indoors when the proton storm hits," says Cucinotta. But the Moon beckons and when explorers get there they're not going to want to stay indoors. A simple precaution: Like explorers on Earth, they can check the weather forecast--the space weather forecast. Are there any big 'spots on the sun? What's the chance of a proton storm? Is a coronal mass ejection coming? All clear? It's time to step out.